The Red Hot Chili Peppers jammed through an Oklahoma ice storm to a sold out crowd at the BOK Center on Saturday, January 14. Tulsa hosted the event for the beloved band with a performance and show that left the audience roaring. This is the band’s eleventh appearance in the state since 1984. With a career spanning more than thirty years, members of the Chili Peppers keep their music and spirits young. Songs and albums defining the California groove and landscape have always stuck with them, and have attracted millions of listeners around the world. Candle-like objects hung swinging ever-so-slightly from the ceiling over the stage and stretching into the middle section of the arena. The stage was almost seven feet above the ground and spotlights spun around the BOK Center as people shuffled to find their place. As the crowd settled and found their seats, band member Michael “Flea” Balzary took the stage for a brief moment. In almost instant recognition, Balzary was welcomed with loud cheers and open arms. “We love Oklahoma. We’ve been coming here since the eighties and it’s good to be back,” he said. Balzary introduced “close friend,” and first opener of the night Jack Irons. He described a bit of the relationship and history of the band with Irons, and with a brief wave, he handed the stage to his friend. After a departure from the group due to personal reasons in 87’, Irons is now touring with his former bandmates for “The Getaway” tour as an opener in select dates, performing a 20 to 30 minute set. His solo work as an artist was reproduced on stage in a psychedelic, drum-battering, handful of songs set to the backdrop of blazing colors and swirling images through each song. The pieces performed were a showcase of his style as a solo artist and his technique as a drummer. His songs were composed around drone-like tones and horns with saxophones revolving around the leading driving drums. A collage of images showing inverted color landscapes of Egyptian pyramids and Machu Picchu superimposed with showgirls and oceanside views complemented the abstract sounds Irons created through neo-psychedelic production. After a short break came the second opener, Trombone Shorty & Orleans Avenue hailing from New Orleans. A quick countdown brought an electrifying start to their set, with a brass band style and vocalist Troy Andrews playing his signature trombone to lead the charge. Trombone Shorty is known for his style of mixing R&B, rock, and funk. Working with artists such as Lenny Kravitz, ZHU, Green Day, and U2. His eclectic and varied influences really shine in his music. The crowd immediately reacted to the change of pace and the cheers echoed on. Leading the hype, Andrews fed off the energy, and played a set that got people out of their seats, clapping, and singing. A well rounded band composed of guitar, bass, and brass gave Trombone Shorty & Orleans Avenue’s sound a place to stay. They made some fans that night. There was little wiggle room once the band made their sendoff. 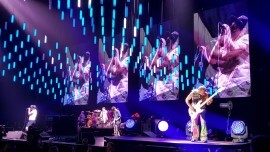 A warm invitation to the “Big Easy” was given to all in attendance as Andrews and the band thanked the crew and the Red Hot Chili Peppers for the opportunity. Then came the hard part. The arena sat still in anticipation for the headliners. Event crew were well aware of the restlessness, and held stern looks for anything out of place. Background music offered a segway into dimmed lights and a cheering crowd. While the people stood up from their chairs, a deep bassoon solo resonated throughout the arena. The show was about to start. A mix of quick and sharp melodies with soft and soothing notes were the introduction for Flea on bass, lead guitarist Josh Klinghoffer, and Chad Smith on drums. The screams and cheers were deafening. Both guitar players began a medley of riffs and synchronized plucking to a hectic culminating climb, while Smith held a frantic beat for a moment then slowed things down dramatically. The arena fell silent. On the come down, Klinghoffer strummed those familiar beginning notes of their song “Can’t Stop.” With no hesitation, out walks lead singer Anthony Kiedis to an arena in pure elation as the beat dropped. Above the stage the candle shaped objects burst into color and dropped in different heights to the beat of the music. Working in patterns with harmony, they created different shapes and moods for the changing tones of the song. Like the changing scenery, the lights flickered and created shapes for the audience to view in awe – bar lighting, rainbow clusters, and waves. Using the entire stage, Kiedis, Flea, Smith, and Klinghoffer jumped, swayed, and jammed their way to a set that captured the unique nature of the band’s history and the wide musical palette of classic tracks like “Dani California” or “Scar Tissue” provide. Short pauses were taken by the lead singer in between songs. He walked off stage to talk to a few people and rest. It was clear that after the first handful of songs he was feeling some sort of discomfort. During the pause, Kiedis slowly walked toward the amp next to Smith. He hopped to sit down on top of it after taking his shirt off. Losing clothes is a staple of the Red Hot Chili Peppers. Meanwhile, crew rushed to bring a stool for Kiedis to sit on for the rest of the set. As he slowly walked on stage, the crowd welcomed him back as if it were the first time they had seen him on stage. The repeated riff of the track “By The Way,” began, and thousands of fans screamed in what seemed like a chorus. Mellow vocals mixed into the union of guitar and bass at the start of the track. The sounds gave way a frantic light show and a blood-pumping drum section that mimics the almost schizophrenic movements that are spread throughout the song. Kiedis thanked Oklahoma, and held his head high as he walked off the stage with his bandmates. The arena slowly chanted “encore,” and like fireflies, thousands of cellphone flashlights lit the arena in the hopes of bringing the band back. The four walked back to the stage for one last time. “Give It Away,” which felt like the perfect send off. The band’s presence and showmanship represented what the Red Hot Chili Peppers are all about. A hectic, smooth, boisterous, and fun concert is all anyone could ask for from a band whose career spans more than three decades. A successful show and a humble gesture will hopefully see the Red Hot Chili Peppers back in Oklahoma soon, but for now, those of us who attended can hold on to this moment until then.